Emx1 has long been implicated in embryonic brain development. Previously we found that mice null of Emx1 gene had smaller dentate gyri and reduced neurogenesis, although the molecular mechanisms underlying this defect was not well understood. To decipher the role of Emx1 gene in neural regeneration and the timing of its involvement, we determine the frequency of neural stem cells (NSCs) in embryonic and adult forebrains of Emx1 wild type (WT) and knock out (KO) mice in the neurosphere assay. Emx1 gene deletion reduced the frequency and self-renewal capacity of NSCs of the embryonic brain but did not affect neuronal or glial differentiation. 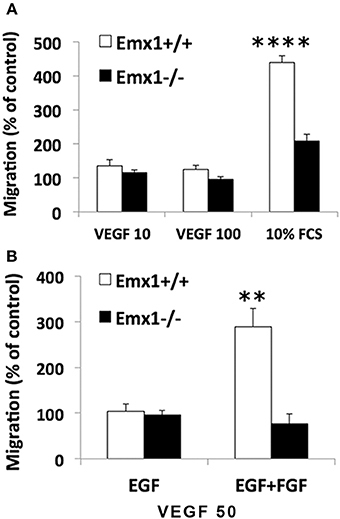 Emx1 KO NSCs also exhibited a reduced migratory capacity in response to serum or vascular endothelial growth factor (VEGF) in the Boyden chamber migration assay compared to their WT counterparts. A thorough comparison between NSC lysates from Emx1 WT and KO mice utilizing 2D-PAGE coupled with tandem mass spectrometry revealed 38 proteins differentially expressed between genotypes, including the F-actin depolymerization factor Cofilin. A global systems biology and cluster analysis identified several potential mechanisms and cellular pathways implicated in altered neurogenesis, all involving Cofilin1. Protein interaction network maps with functional enrichment analysis further indicated that the differentially expressed proteins participated in neural-specific functions including brain development, axonal guidance, synaptic transmission, neurogenesis, and hippocampal morphology, with VEGF as the upstream regulator intertwined with Cofilin1 and Emx1. Functional validation analysis indicated that apart from the overall reduced level of phosphorylated Cofilin1 (p-Cofilin1) in the Emx1 KO NSCs compared to WT NSCs as demonstrated in the western blot analysis, VEGF was able to induce more Cofilin1 phosphorylation and FLK expression only in the latter. Our results suggest that a defect in Cofilin1 phosphorylation induced by VEGF or other growth factors might contribute to the reduced neurogenesis in the Emx1 null mice during brain development. Mammalian homeobox gene transcription factors including the Emx, Hox, Pax, and Dlx, have been implicated in the development of the forebrain (Boncinelli et al., 1995; Panganiban and Rubenstein, 2002; Gavalas et al., 2003; Muzio and Mallamaci, 2003; de Melo et al., 2005). Among which, the Emx family plays a crucial role in neurogenesis including neuronal migration, differentiation, and synaptic connectivity (Simeone et al., 1993). As the homolog of the Drosophila melanogaster empty spiracles ems gene, the Emx genes are well conserved in mammals and insects, sharing ~82% homology in amino acid identity with the ems homeodomains (Cecchi and Boncinelli, 2000). Two of the Emx1 isoforms, Emx1 and Emx2, share a number of functional and structural characteristics with overlapping patterns of spatio-temporal expression (Simeone et al., 1992; Gulisano et al., 1996; Chan et al., 2001). Whereas, Emx2 is expressed in the dorsal and ventral telencephalon and hypothalamus, Emx1 is restricted to the dorsal telencephalon (Simeone et al., 1992). Single Emx1 mutants showed a lack of corpus callosum with minimal structural or histological brain anomalies in contrast to the profound and severe developmental defects observed in Emx2 mutants, such as disorganized olfactory bulb and reduced size of the cerebral cortex and hippocampus (Pellegrini et al., 1996; Qiu et al., 1996; Bishop et al., 2003). With respect to neurogenesis, we have demonstrated that Emx1, similar to Emx2, contributed to the genesis of the dentate gyrus (DG). Apart from the impairment in skill reaching learning, as well as blunted anxiety and depression (Cao and Li, 2002), the adult Emx1 mutants exhibited smaller DG, coinciding with a decreased number of immature neurons and proliferating progenitor cells in the DG (Hong et al., 2007). However, the mechanism by which Emx1 contributes to neurogenesis and the critical developmental stage involving Emx1 is not well understood. Neurogenesis encompasses several processes including the proliferation and differentiation of neural stem cells (NSCs), as well as the migration and survival of newborn neurons (Frisén, 2016; Liu and Song, 2016). Established evidence suggests that neuroblasts migrate in close association with blood vessels following the division of NSCs (Thored et al., 2007; Zhang et al., 2014). A number of vascular factors including VEGF contribute to the formation and maintenance of the neurovascular niche of neurogenesis (Li Q. et al., 2006; Madri, 2009; Ward and Cunningham, 2015). The current study sought to decipher the role of the Emx1 gene in reduced neural regeneration and determine the putative mechanisms implicated by employing neuroproteomics-systems biology platforms and biochemical approaches. Our results indicate that Emx1 gene deletion not only resulted in reduced embryonic neurosphere formation with diminished self-renewal capacity, but also negatively impacted the chemotaxic response of NSCs to VEGF or serum. Proteomics analysis suggests that the deficiency in Cofilin1 phosphorylation may underlie the defective signaling of NSCs in response to VEGF or other growth factors, potentially leading to abnormal forebrain development. This study was conducted in accordance with the animal care guidelines issued by the National Institutes of Health and by the San Francisco Veterans Affairs Medical Center Animal Care and Use Committee. Adult mice heterozygous for Emx1 gene derived from cryopreserved embryos at Jackson Laboratory were bred to generate heterozygous and homozygous offspring that were maintained in house in the institutional standard cages (4 mice per cage) on a 12-h light/12-h dark cycle, with ad libitum access to water and food before and during experimental procedures. All in-vitro and in-vivo procedures were conducted by examiners blinded to experimental conditions (for the detailed methodology of Western blot analysis and antibodies used, please refer to Data Sheet 1 in the Supplementary Material). Forebrains were dissected from Emx1 WT or KO embryos at embryonic day 14 (E14) harvested from time-pregnant mice. Neurosphere assay for the adult mice (2.5 months of age) were conducted from the dissected subventricular zone (SVZ) or the hippocampus. After enzymatic digestion with Papain (10 U/ml) and DNase (0.5 mg/ml) (Sigma Aldrich, St. Louis, MO, USA) solution at 37°C for 20 min, brain tissue was mechanically triturated with a fire-polished Pasteur pipette into single cell suspension and resuspended in DMEM-F12 (1:1) medium in the presence of hEGF (20 ng/ml) or hEGF (20 ng/ml) + FGF (10 ng/ml) (Invitrogen, Eugene, Oregon, USA) and heparin (2 μg/ml) (StemCell Technologies, Inc., Vancouver, BC, Canada). Neural colony forming cell (NCFC) assay kit (StemCell Technologies, Inc., Vancouver, BC, Canada) was used for neurosphere assay. Cells were suspended in complete NeuroCult NCFC medium, and mixed with collagen solution, 7500 cells were dispensed into 35 mm culture dishes and cultured for 21 days. hEGF and FGF-2 (20 ng/ml each) was added into the semi-solid culture every 7 days. The diameters of spheres were measured using a 2 mm-grid dish on a Zeiss invert microscope. Remaining cells were suspended in proliferation medium composed of DMEM/F-12 (1:1) containing B27 supplement and 20 ng/ml hEGF, and were cultured in a T-75 tissue culture flask to form primary floating neurospheres. Floating neurospheres were passaged every 7 days. Primary neurospheres were mechanically dissociated into single cells suspension and ~400 viable cells were plated into each well of a 6-well cell culture plate containing proliferation medium. The number of secondary neurospheres generated in each well was counted 10 days after plating and averaged (n = 3–4 replicates/neurosphere samples/genotype). Neurospheres were harvested after 2nd passage by centrifugation at 500 rpm for 5 min and resuspended in growth factor-free DMEM/F-12 (1:1) medium. Cells in neurospheres were mechanically dissociated by trituration and filtered through 0.45 μm cell strainer. Viable single cells (105 cells/well) were plated on poly-D-lysine/laminin coated 6-well culture plate in DMEM-F12 (1:1) plus NeuroCult NSFC differentiation supplements for 10 days. The differentiated cells were fixed with 4% paraformaldehyde in 0.1 M PBS for 15 min, and then washed with PBS twice. Differentiated cells were immunostained with following reagents: mouse anti-GFAP; mouse anti-Tuj1; rat anti-nestin; Cy3 goat anti-mouse; biotinylated sheep anti-rat; Cy3 streptavidine. Cells were count stained with DNA dye Hoechst. Stained cells were photographed with a Zeiss invert fluorescence microscope. Differentiation ratio was calculated as immuno-positive cells divided by total cells stained with Hoechst. The migration of the NSCs in response to fetal calf serum (FCS) or recombinant human VEGF165 (R&D Systems, Minneapolis, USA) was assessed using a modified Boyden chamber assay as previously described (Lamszus et al., 1998; Schmidt et al., 2009). Briefly, quadruplicates of media containing 10% FCS or VEGF were added to the lower wells of a 96-well modified Boyden chamber (Neuro Probe, Gaithersburg, MD, USA), and wells were covered with an 8-μ m pore size Nucleopore filter that had previously been coated with 10 μg/ml laminin (Invitrogen, Eugene, Oregon, USA). NSCs from dissociated neurospheres passages 3–4 were then suspended at 2.5 × 104 cells in 50 μl of either serum-free DMEM/F12 medium containing 0.1% bovine serum albumin (BSA) or in growth medium containing EGF alone or EGF+FGF and seeded into the upper wells. After incubation for 15 h at 37°C, non-migrated cells were scraped off the upper side of the filter and filters were stained with Diff-Quik (VWR, Brisbane, CA, USA). Nuclei of migrated cells were counted in an average of 180 high power fields (field size 20 × 20 to 100 × 100 μm) using a 40x objective by using the Stereo Investigator software (Stereo Investigator, MicroBrightField, VA). Values were assessed in quadruplicate from at least three independent experiments and expressed as mean ± standard deviation in percentage of the control migration (= 100%). The control migration rate for each assay was assessed in response to either serum-free medium containing 0.1% BSA or growth medium containing EGF or EGF+FGF. Forty milliliters of NSCs (passage 2), seeded with a density of 100,000 cells/ml, were harvested after 5 days of growing in defined media by centrifugation at 400 × g. Cell pellets were lysed in 1 ml of lysis-buffer containing 9 M urea (Sigma), 4% (w/v) CHAPS (Calbiochem, San Diego, CA), 0.5% (v/v) pharmalytes pH 3–10 (Amersham Bioscience), 1 mM EDTA (American Bioanalytical, Natick, MA), Complete protease inhibitor tablets were from Roche (Indianapolis, IN). Homogenates were triturated using a syringe with 20G-needle and incubated for 1 h at RT. After samples were centrifuged at 4000 rpm for 10 min, supernatants were transferred into an empty 1.5 ml tube, while pellets were discarded. To determine protein concentrations the 2-D-Quant-protein concentration kit (Amersham Bioscience) was used following the instructor's guideline. The first dimension was performed using an Ettan IPGphor II isoelectric focusing unit (Amersham Bioscience). Five-hundred micrograms of protein sample were mixed with 0.2% (v/v) ampholytes (Amersham Bioscience) and 170 μl of 2 × rehydration-buffer containing 9 M urea, 2% (w/v) CHAPS, 0.002% (w/v) bromphenol blue, 18 mm of dithiothreitol (DTT (ThermoFisher), and 0.5% IPG-buffer 3–10 (Amersham Bioscience). To reach the final volume of 340 μl, lysis-buffer (see above) was added. Each sample was pipetted into a slot of the dehydration tray in which an 18 cm-Immobilene™ Dry Strip pH 3–10 (Amersham Bioscience) was placed upside down. In order to inhibit drying-out of the solution overnight each slot was covered with mineral oil (Amersham Bioscience). The strips passively rehydrated at constant 25°C for 18 h. Afterwards the strips were transferred to the focusing tray where the proteins were separated according to their isoelectric points using the following protocol: 1 h at 150 V, 3 h at 300 V, 6 h at 1000 V using the linear ramp, 3 h at 6000 V using the linear ramp, and 3 h at 6000 V. To inhibit diffusion of the proteins after focusing the machine held 50 V until manually stopped. After the focusing process strips were equilibrated two times for 10 min in a buffer containing 50 mM of Tris-HCl (pH 8.8), 6 M Urea, 30% (v/v) glycerol, 2% (w/v) SDS, 0.002% (w/v) bromphenol blue and either 65 mM DTT. Equilibrated strips were put on top of a 12% polyacrylamide gel, made by using standard laboratory procedures, and covered with 0.5% (w/v) melted agarose also containing 0.002% (w/v) bromphenol blue. Ten microliters of a molecular weight standard (BioRad, Hercules, CA) was dropped on a piece of blotting paper and was put next to the strip into the agarose solution before polymerization. Gels were run over night at 10 μA per gel at 4°C using an Ettan DALTsix electrophoreses unit (Amersham Bioscience, Piscataway, NJ; for the detailed methodology of Gel staining with silver or Coomassie Blue, please refer to Data Sheet 1 in the Supplementary Material). Peptide extracts were separated on-line by nanoLC utilizing a 2D LC NanoLC System (Eksigent/AB Sciex). Liquid chromatographic separations were performed using a PepMap (Dionex/LC Packings) trap column and a reversed phase nano-column (75 μm in diameter × 150 mm in height packed in-house with Jupiter Proteo C12 endcapped resin, 90 Å pore size, 4 μm particle size). An aliquot of peptide extract (3–4 μL) was loaded onto the trap column with loading solvent (0.1% formic acid) at a flow rate of 20 μL/min. The trap column was washed with the loading solvent for 3 min prior to switching it in line with the reversed phase nano-column. The nano-column and elution buffers were maintained at ambient temperature and mobile phase flow rate was 250 nL/min. The nano-column was equilibrated with 2% Solvent B in Solvent A for 20 min prior to sample injection (Solvent A: 2% acetonitrile/0.1% formic acid; Solvent B: 80% acetonitrile/0.1% formic acid). Peptide separation was accomplished using a binary gradient which consisted of a 5 min isocratic wash at 2% B followed by a linear gradient of 2–50% B over 45 min, and concluded with a column cleanup step of 95% B for 7 min. The nano-column was interfaced directly to a nanoelectrospray ion source (Protana) mounted on a QSTAR Elite quadrupole/quadrupole/time-of-flight (QqTOF) mass spectrometer (AB Sciex). Protein identification was accomplished by isolating sequentially eluting peptide populations with a single mass-to-charge ratio (m/z), within the mass spectrometer, fragmenting this population, and measuring the masses of the peptide fragment ions. Peak lists were generated with the Mascot Daemon (Matrix Sciences) and the Mascot v2.2 search engine (Matrix Science) was used to search the experimentally determined peptide fragment ion masses against a theoretical fragment ion mass database generated by in silico digestion and fragmentation of all proteins in the UniProtKB/Swiss-Prot Protein Knowledgebase (downloaded 03-09-2011; 525,997 protein sequences; 185,874,894 residues), taxonomy: rodentia (25,596 protein sequences). The following search parameters were utilized: precursor ion mass tolerance ± 150 ppm; fragment ion mass tolerance 0.15 Da; tryptic digestion; 2 missed cleavages; p < 0.05; ion score or expect cut-off 0.05; fixed modification: Cys-carbamidomethyl; variable modifications: deamidation (Asn and Gln), Met-sulfoxide, and Pyro-glu (N-term Gln; for the detailed methodology of In-gel digestion procedure, please refer to Data Sheet 1 in the Supplementary Material). The Elsevier's Pathway Studio v. 10.0 (Ariadne Genomics/Elsevier) was used to deduce relationships among differentially expressed proteomics protein candidates using the Ariadne ResNet database (Bonnet et al., 2009; Yuryev et al., 2009). “Subnetwork Enrichment Analysis” (SNEA) algorithm was selected to extract statistically significant altered biological and functional pathways pertaining to each identified set of protein hits SNEA utilizes Fisher's statistical test used to determine if there are nonrandom associations between two categorical variables organized by specific relationship. SNEA starts by creating a central “seed” from all relevant entities in the database, and retrieving associated entities based on their relationship with the seed (that is, binding partners, expression targets, protein modification targets, regulation). The algorithm compares the sub-network distribution to the background distribution using one-sided Mann–Whitney U-Test, and calculates a p-value indicating the statistical significance of difference between two distributions. In our analysis, “GenBank ID symbols” of the 38 altered proteins from 2D-PAGE-MS/MS spectrometry data were imported to the software to form an experimental data set. For the reconstruction of networks of pathways, biological processes, and Molecular function were evaluated for each single protein hit and its associated targets (networks and pathways; Daraselia et al., 2012; Pyatnitskiy et al., 2014). Integrated Venn diagram analysis was performed using “the InteractiVenn”: a web-based tool for the analysis of comlex data sets. Green rectangles, violet rectangles, and blue hexagons reflect biological processes, disease processes, and functional classes, respectively. The different colors of proteins reflect their degree of expression. Differentially expressed proteins were GO-classified based on the PANTHER (Protein ANalysis THrough Evolutionary Relationships) system (http://www.pantherdb.org; Mi et al., 2016). PANTHER software classifies genes and proteins by their functions, using published scientific experimental evidence and evolutionary relationships abstracted by curators with the goal of predicting function even in the absence of direct experimental evidence (Mi et al., 2010). Proteins are classified into families and subfamilies of shared function, which are then categorized using a highly gene controlled vocabulary (Gene Ontology terms) by biological process, molecular function and cellular localization (for the detailed methodology of Gene Ontology analysis, please refer to Data Sheet 1 in the Supplementary Material, a detailed description of these data is presented in the Supplemental Figures 1–3). NSCs were plated onto poly-L-ornithine coated plates at 105/well (24-well plate). Twenty-four hours post plating, recombinant mouse VEGF-A (100 ng/ml, R&D system) was added to culture medium and BrdU was added into culture 24 h later at a concentration of 10 μM prior to fixation with 4% PFA. SU1498 was added into culture at 5 or 10 μM prior to the addition of VEGF. The number of BrdU positive cells was quantified only in live cells. Data were expressed as mean ± s.e.m. Statistical tests were carried out with one-way or two-way analyses of variance (ANOVAs) followed by post-hoc paired comparisons using the Fisher's PLSD test when appropriate (Statview 5.0.1, SAS Institute Inc., Cary, NC). Values of p < 0.05 were considered as significant. Emx1 deletion is associated with the reduction of volume and immature neurons in the dentate gyrus (DG) of adult mice (Hong et al., 2007). To determine whether this abnormality originated from the early stage of brain development, neurosphere assay was performed with embryonic or adult brains from Emx1 knockout (KO) and wild type (WT) mice. Although embryonic brains from both genotypes formed neurospheres, the number of neurospheres or neuroprogenitor cells (0.5 mm < diameter < 1 mm) in E14 Emx1−/− forebrains was significantly less than those of Emx1+/+ brains. In addition, the size of neurospheres was smaller, indicating that Emx1−/− embryonic NSCs had a limited proliferative potential (Figures 1A,B). The frequency of neurospheres formed during 21 days of culture also differed depending on the presence of growth factors. There was a significant effect of FGF on the frequency of neurospheres greater than 0.5 mm in diameter in both genotypes (Figure 1). In contrast to the embryonic brains, the adult brains harbor very few true NSCs in either genotype. There was also no significant difference in the overall frequency of NSCs within the progenitor regions of subventricular zone or the hippocampus between genotypes (Figure 1C). Figure 1. The effect of homeobox gene Emx1 deletion on the formation of neurospheres in the embryonic and adult forebrains. Neurospheres grown on the semi-solid collagen plates were categorized into four groups according to size as indicated (A). Neurospheres that have a diameter of more than 2 mm are regarded as true neural stem cells and others are progenitor cells (Louis and Reynolds, 2010). (B) Neural colony forming cell assay demonstrates that Emx1−/− embryonic forebrains formed significantly less neurospheres with sizes between 0.5 and 1 mm in diameter. The presence of FGF-2 (20 ng/ml) in the growth medium enhanced the genotype disparity in neurosphere formation. The p-values of the main effects of genotype and FGF following 2-way ANOVA are summarized as shown. Sample sizes for WT EGF, KO EGF, WT EGF+FGF, KO EGF+FGF are 4, 6, 4, 6, respectively. (C) The frequency of neurospheres per plated cells from the dissected subventricular zone (SVZ) or hippocampus (HP) in the adult forebrains cultured in the presence of EGF+FGF. There was no significant difference in the frequency of neurospheres from adult brain tissue between two genotypes. Unlike the embryonic brains, the adult brains have very few true neural stem cells (≥ 2 mm in diameter). N = 4–6 brain samples/group for embryonic and 4–9 brain samples/group for adult neurosphere assay. Neurospheres contain multipotent NSCs with heterogeneous capacity in clonal expansion. To determine whether the observed difference in the number or size of neurospheres is attributed to differences in self-renewal capacity between genotypes, we quantified the number of secondary neurospheres generated by single primary neurospheres following 10 days of culture in a self-renewal assay. We found that primary neurospheres from forebrains of both Emx1 WT and KO embryos had the ability of self-renewal (Figure 2A), but differed in the extent of producing secondary neurospheres (Figure 2B). The numbers of primary and secondary neurospheres from Emx1 KO brains were significantly reduced to ~30 and 50% of those from the Emx1 WT ones, respectively (Figure 2). Figure 2. The self-renewal capacity is diminished in embryonic Emx1−/− NSCs. (A) There is a significant effect of genotype (p < 0.05) and FGF (p < 0.05) on the total number of primary neurospheres of all sizes formed from dissociated E14 forebrains. (B), Primary neurospheres from Emx1 WT and Emx1 KO mice were mechanically dissociated into single cells, counted and plated at clonal density. The number of secondary neurospheres generated from triplicate sets of 400 viable cells derived from the primary neurospheres from each forebrain sample was quantified after 10 days. Both primary neurospheres from forebrains of Emx1 KO and Emx1 WT embryos were able to self-renew. However, the ability of dissociated primary neuospheres from Emx1 KO to form secondary neurospheres was reduced compared to those from Emx1 WT (genotype effect: p < 0.01). There was no significant effect of FGF on the formation of secondary neurospheres. N = 6/group. *p < 0.05; **p < 0.01. To compare the extent of multipotency of NSCs derived from Emx1 WT and KO embryonic forebrains, cells from neurospheres of both genotypes were exposed to differentiation medium for 10 days. The majority of dissociated NSCs cultured as monolayer cells displayed immunoreactivity for nestin, a marker of neuroprogenitor cells, prior to the induction of differentiation (Figures 3A–D). Multipotency was demonstrated by differentiation into TuJ1-positive neurons, and GFAP-positive astrocytes. 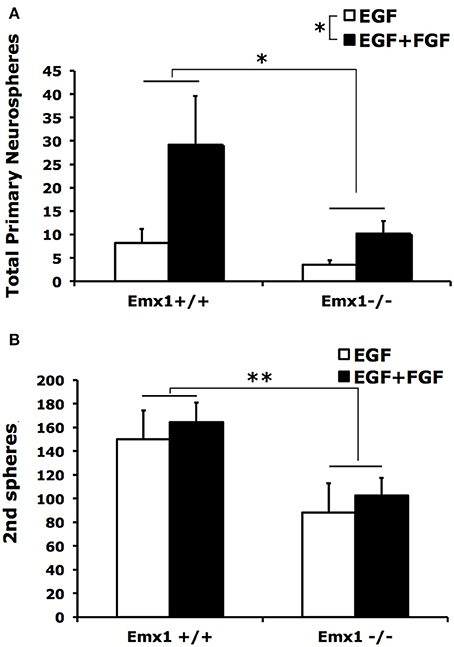 However, no difference was found in the differentiation ratio of neurons or astrocytes between Emx1 WT and Emx1 KO NSCs (Figure 3E). Figure 3. Neuronal and glial differentiation from embryonic NSCs is not affected by Emx1 gene deletion. NSCs differentiate in response to growth medium containing differentiation supplement after 7–14 days. Representative photomicrographs showing undifferentiated neural stem cells grown as monolayer (Nestin; A, soon after seeding; B, 7 days after seeding), differentiated neurons (C, TuJ1) and glia (D, GFAP) in red and nuclei in blue (Hoechst). Bar graph indicated the quantitative results for differentiation. The extent of neuronal vs. glial differentiation was determined by counting 200 cells after staining with antibodies against TuJ1 and GFAP. 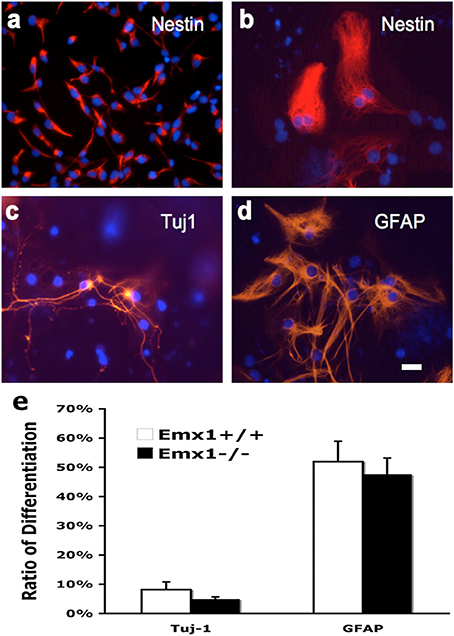 No differences in the differentiation ratios of neurons and astrocytes between Emx1+/+ and Emx1−/− group (E). Scale bar, 25 μm. N = 4 NSC samples/group, and each NSC sample was plated in 3–4 wells. Neuroblasts migrate in close association with blood vessels and long-distance migration of neuroblasts was found in peri-infarct tissue in human stroke, implicating a role for VEGF or other angiogenic factors in neurogenesis and neuroblast migration. To quantify the chemotactic response of NSCs, a modified Boyden Chamber assay was used in the presence of FCS or chemokine VEGF165 as chemoattractants. In response to 10% FCS, Emx1 WT NSCs exhibited a 2.1-fold increase in chemotaxis activity relative to Emx1 KO NSCs. When cultured in the presence of EGF, NSCs of either Emx1 genotype failed to migrate in response to VEGF165 at 10 or 100 ng/ml (Figure 4A). In contrast, when cultured in the presence of EGF and FGF, VEGF165 at 50 ng/ml was able to induce a robust migration of Emx1 WT NSCs compared to Emx1 KO NSCs (Figure 4B). Out findings indicate that Emx1 gene deletion negatively impacted the chemotactic response of NSCs toward serum or VEGF, and the migration Emx1 WT NSCs induced by VEGF requires the presence of FGF in addition to EGF (Zhang et al., 2014). Figure 4. Chemotactic response to serum or VEGF is reduced in Emx1−/− NSCs. (A) Emx1 KO NSCs exhibited a reduced chemotactic response to serum compared to Emx1 WT NSCs. The migratory response of E14 NSCs to fetal calf serum (FCS) and recombinant human VEGF165 were tested in a modified 96-well Boyden chamber assay when cells were cultured in medium containing EGF. Ten percent FCS induced a 4.4-fold (439 ± 19%) and 2.1-fold (209 ± 19%) increase in migratory response in Emx1 WT and Emx1 KO NSCs, respectively. To the contrary, VEGF, either at 10 or 100 ng/ml, stimulated very little migration of NSCs from either genotype. (B) FGF is necessary for the chemotactic response of Emx1 WT NSCs to VEGF. NSCs were cultured in medium containing either EGF alone or EGF+FGF. Chemotaxic response toward 50 ng/ml VEGF was detected in NSCs from Emx1 WT, but not from Emx1 KO, cultured in the presence of EGF+FGF. Values shown are mean ± SEM and are expressed as percentage of the unstimulated basal migratory rate (control = 100%). **p < 0.01; ****p < 0.001. N = 24–32/group. Using tandem mass spectrometry, we analyzed a number of most distinctly different spots on the 2-D PAGE comparing the patterns of protein expression from the lysates of Emx1 WT and KO embryonic NSCs (Figure 5). Our neuroproteomics analysis detected 38 differentially expressed proteins between Emx1−/− and Emx1+/+ (see Table 1 for protein Ids and their respective biological functions). Detailed characteristics of each individual protein with its corresponding mass spectrometry data are included in Supplemental Tables 1, 2 and Data Sheet 1 in the Supplementary Material. Figure 5. 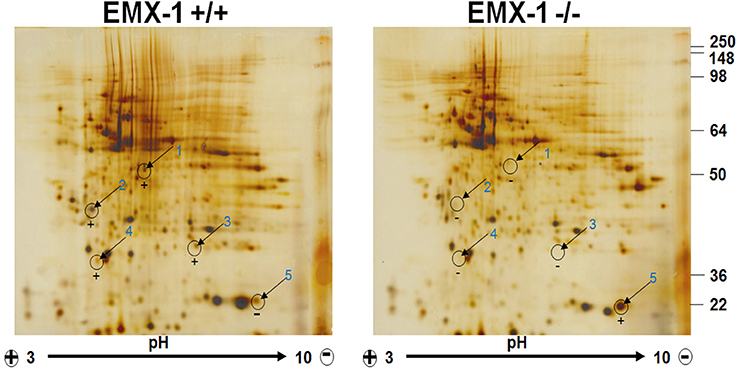 Two-Dimensional Gel Electrophoresis proteomic profiling of Emx1+/+ and Emx1−/− NSCs. Differential comparative proteome profile from Emx1+/+ and Emx1−/− NSCs lysates was compared and visualized by silver staining. Comparative Coomassie stain performed on gels was used for spot cutting. Five most apparent spots showing differential expression level between genotypes were labeled and excised for protein identification by tandem MS/MS analysis. Spot #5 was identified as Cofilin through Swiss-Prot Protein Knowledgebase. Table 1. Differentially altered proteins and their functional ontology between Emx1+/+ and Emx1−/− NSCs as identified from spots on the 2-D gel. Based on the above neuroproteomics findings, we utilized a neurosystem biology platform for protein network and pathway analysis relevant to the altered proteins in the Emx1+/+ vs. Emx1−/− NSCs. For this purpose, we utilized two bioinformatics analysis approaches: a global protein interaction and unsupervised pathway assessment on one side and a cluster targeted approach for selective implicated functional biological pathways on the other hand. For the targeted cluster analysis, selected Emx1-implicated pathways were assessed against Emx1-identified differential proteomic data. Using the SNEA algorithm, targeted enriched pathways revealed that several altered proteins were associated with Emx1 differential proteome-implicated neural pathways including: cell proliferation, cell migration, cell differentiation, cytoskeletal actin organization, and neuronal migration as illustrated in Figures 6A–E. For detailed cluster analysis in silico validation including statistical analysis, protein entity, biological process along with the interaction type and the PubMed reference utilized see Supplemental Tables 3A–C, 4A–C, 5A–C, 6A–C and Data Sheet 1 in the Supplementary Material. Figure 6. Altered Emx1-related protein cluster analysis extracted from the Sub Network Enrichment Analysis (SNEA) Algorithm. Subnetwork Enrichment Pathway Analyses and statistical testing for the entire altered Emx1 proteome was analyzed using the SNEA algorithm to identify unique biological clusters of differential proteins. Several proteins were clustered under certain functional classes, such as cell proliferation, cell migration, cell differentiation, cytoskeletal organization, and neuronal migration (Clusters A–E). In silico cluster analysis validation including the protein Entity and biological process involved along with the interaction type and directionality and the PubMed reference utilized to derive these interaction type are presented in Supplemental Tables 3A–C, 4A–C, 5A–C, 6A–C and Data Sheet 1 in the Supplementary Material. The shape of a given protein is indicative of its functional class as shown in the legend (rectangular shapes indicate the biological process) & (the elliptical shape indicates the proteins). Also included in the legend is the directionality relation of the protein with the corresponding biological process (arrow head). For the global interaction and unsupervised pathway assessment, differential pathways were generated using the “direct interaction” algorithm to map the relationship among the identified proteins. We found that among the 38 altered proteins, 17 had direct regulatory function, including binding, post-translational modifications and transcriptional regulation. Unsupervised pathway assessment, showed that these proteins are implicated in several biological pathways involving brain development, axonal guidance, synaptic transmission, neurogenesis along with the hippocampal morphology biological process (highlighted in blue rectangles). Of interest, these altered proteins showed a centrality relation with VEGF protein being an upstream regulator for several of the Emx1-identified proteome involving Cofilin1, enolase, phosphatidyl-ethanolamine-binding protein, and neurite growth-promoting factor 2 (Figure 7). Statistical significance of the interaction was performed in silico for the validation process. A detailed depiction of these data is presented in the (Supplemental Tables 7A–C and Data Sheet 1 in the Supplementary Material). These include the protein entity and biological process involved along with the interaction type and directionality and the PubMed reference utilized to derive these interaction type. Due to the well-recognized central role of Cofilin1 and its diverse interaction with several of the identified biological pathways, we performed a functional validation analysis to determine the expression of Cofilin1/p-Cofilin1in the NSCs of both genotypes in response to VEGF signaling. Figure 7. Global Interaction Map and differential regulatory pathways of the Emx altered proteome. Altered Emx1-identified proteins are highlighted in light pink. Seventeen out of the 38 proteins had direct regulatory relationships, including binding, post-translational modifications, and transcriptional regulation. Differential pathways were generated using the “direct interaction” algorithm to map interaction and relationships. Based on Biological Process analysis and molecular functions, these proteins are implicated in brain development, axonal guidance, synaptic transmission, neurogenesis along with the hippocampal morphology biological process (highlighted as rectangles). VEGF-A was identified as the upstream regulator of the represented processes, intertwined with Cofilin1 and Emx1. In silico validation including the protein Entity and biological process involved along with the interaction type and directionality and the PubMed reference utilized to derive these interaction type are presented in Supplemental Tables 7A–C and Data Sheet 1 in the Supplementary Material. To further determine whether Cofilin1 plays a role in VEGF signaling, lysates of NSCs from both genotypes stimulated with VEGF or media were analyzed by western blotting for the expression of p-Cofilin1, total Cofilin1, and VEGF RECEPTOR 2 FLK. We found that Emx1 KO NSCs had significantly reduced p-Cofilin1 compared to those from Emx1 WT, when cultured in medium containing EGF only or EGF+FGF (Figures 8A,B). VEGF further increased the level of p-Cofilin only in the WT NSCs (Figures 8A,B). VEGF also modestly induced the expression of FLK only in the WT NSCs (Figures 8A,C). Our results suggest that Emx1 gene deletion reduces phosphorylated Cofilin1, likely contributes to the difference in neurogenesis and chemotactic response to VEGF. Figure 8. 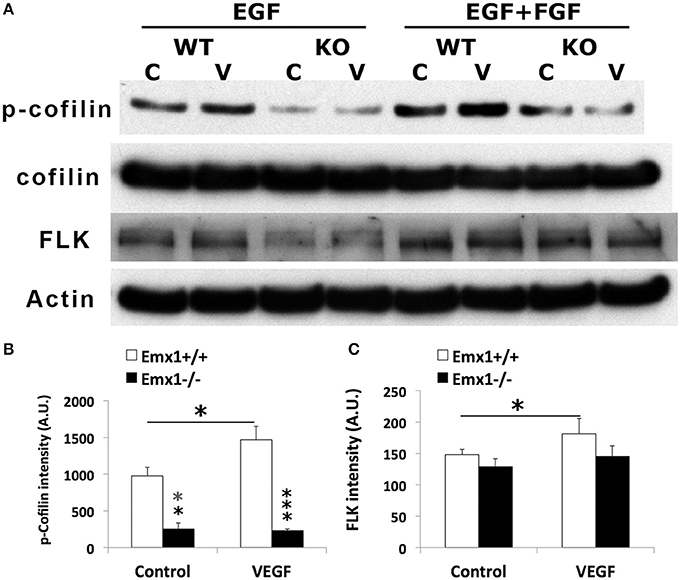 VEGF induces Cofilin1 phosphorylation in Emx1+/+ NSCs. (A) Western blot analysis of NSC lysates for p-Cofilin1, Cofilin1, VEGF receptor 2 FLK and actin from both Emx1 genotypes treated with VEGF (V) (50 ng/ml) or medium (C) for 1 h in the presence EGF, or EGF+FGF as indicated. VEGF increased the level of p-Cofilin1in the Emx1+/+ NSCs cultured in EGF or EGF+FGF, compared to those treated with medium (*p < 0.05). In contrast, Emx1−/− NSCs expressed significantly less amount of p-Cofilin1 whether in the absence (**p < 0.01) or presence of VEGF (***p < 0.005), compared to that of the Emx1+/+ NSCs (B). VEGF increased FLK expression only in the Emx1+/+ NSCs (C, *p < 0.05). N = 3/group. Because VEGF receptors are expressed in NSCs (Maurer et al., 2003) and VEGF stimulates the expansion of NSCs in vitro (Schänzer et al., 2004), we determine the effect of VEGF on the proliferation and survival of NSCs. We found that VEGF-A (100 ng/ml) significantly increased the percentage of BrdU immunoreactive cells already after 4 h (p < 0.05) of treatment. The effect was even more pronounced after 17 h (p < 0.001; Supplemental Figure 1A and Data Sheet 1 in the Supplementary Material). In addition, VEGF-induced NSC expansion was dose dependently reduced by the specific VEGF RECEPTOR 2 antagonist SU1498 (Supplemental Figure 1B and Data Sheet 1 in the Supplementary Material), suggesting that VEGF increased the number of NSCs possibly by stimulating proliferation or enhancing their survival. Existing literature suggests that the Emx1 transcription factor is not among the most critical players in mammalian brain development since the Emx1-single mutant was not only viable but also without any severe CNS phenotype in contrast to the mutations caused by a number of other genes (Patarnello et al., 1997; Guo et al., 2000; Bishop et al., 2002, 2003; Cao and Li, 2002; Muzio and Mallamaci, 2003; Shinozaki et al., 2004; Tamamaki, 2005; von Frowein et al., 2006; Piper et al., 2007; Cocas et al., 2009; Sen et al., 2013). The role of Emx1 during brain development was first implicated in axon guidance, regulating midline crossing of an axonal subpopulation of the corpus callosum derived from the anterior cingulate cortex (Lim et al., 2015). Apart from an acallosal phenotype, the adult Emx1 null mice also exhibited smaller dentate gyri and reduced neurogenesis (Hong et al., 2007). However, it is unclear whether the reduced dentate gyrus is attributed to defective signaling in neurogenesis. By comparing the frequency of neurosphere formation between the WT and KO Emx1 forebrains, we found that the embryonic but not adult Emx1 KO brains had significantly fewer NSCs and neuroprogenitor cells, suggesting that Emx1 was involved in neurogenesis at least during early brain development. The deletion of the Emx1 gene also negatively impacted the self-renewal capacity of isolated NSCs, diminishing their chemotactic response to FCS or VEGF, but it did not affect neuronal or glial differentiation. Comparative proteomics revealed that the altered proteins from Emx1 KO NSCs participated in many aspects of brain development, including axonal guidance and neurogenesis, through interaction with VEGF. Cofilin1 exists in balance with its phosphorylated form in the VEGF signaling pathway. Emx1 KO NSCs appeared to have significantly reduced level of p-Cofilin1 compared to Emx1 WT NSCs. Additionally, VEGF further increased p-Cofilin1 only in the latter. To the best of our knowledge, this is the first study demonstrating the role of Emx1 in neurogenesis and the effect of Emx1 gene deletion on Cofilin1 phosphorylation utilizing proteomics platform. Not surprisingly, the neurosphere assay results indicate that the adult brains harbor significantly fewer neuroprogenitor cells compared to embryonic brains, regardless of Emx1 genotype. It appears that only the embryonic brains contain a significant amount of true NSCs that can be propagated in many generations in vitro, while the adult brains have a number of neurospheres that are >2 mm in diameter. The presence of FGF increases the frequency of neurospheres >0.5 mm in diameter from embryonic brains of both genotypes. A previous report suggests that stem/precursor cells in the embryonic cortex can be very diverse in regards to their signaling property. Linear progression of the precursor cells to an EGF-responsive state can be promoted by FGF among other factors (Lillien, 2014), which is consistent with our observation. There also exists a rostral-caudal gradient of Emx1-lineage precursors, with more cells rostrally. We did not determine the rostral-caudal relationship in the abundance of precursor cells in the embryonic brains due to the small size; however, data from the adult neurosphere assay seem to agree with this finding, as the SVZ tended to produce more neurospheres than the hippocampus. 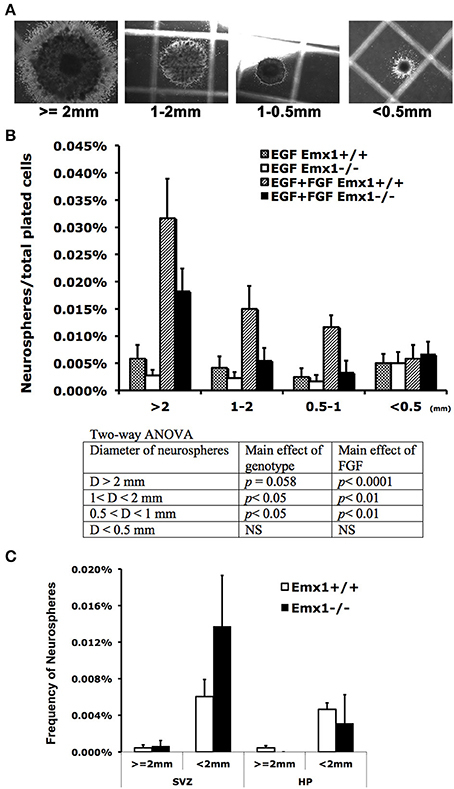 Data from the self-renewal assay suggest that Emx1 KO precursors likely do not respond as well to EGF or FGF signaling to form primary or secondary neurospheres. Apart from its key role in neurogenesis and NSC self-renewal, Emx1 also contributes to other aspects of brain development such as cortical patterning (Stocker and O'Leary, 2016) and regional fate determination (Chou et al., 2009) via the complex interplay between Emx1 and other genes. A proteomic search using 2-D gel electrophoresis coupled with tandem mass spectrometry revealed the differential expression of at least 38 proteins between WT and KO NSCs. These protein hits were assessed via a targeted approach to study their relationship in already established pathways implicating Emx1's role in neurogenesis, and the details regarding their molecular function, biological process and cellular locationization are shown in Supplemental Figures 2–4. Among the proteins identified, OAT, Cofilin1, 14-3-3 beta protein, Creatine Kinase B-type Peroxiredoxin 2, Peroxiredoxin 1, and HNRNPA1 were implicated in the cell differentiation process (Figure 6, Supplemental Tables 3A–C and Data Sheet 1 in the Supplementary Material). This is in agreement with what has been identified in a similar proteomics study performed on neural differentiation of human embryonic stem cells utilizing 2D-DIGE at three different stages early neural differentiation, neural ectoderm and mature neurons. Ten members of the peroxiredoxin (PRDX) family were upregulated in the different stages of differentiation, thus highlighting a link between neural differentiation and the redox process (Hoffrogge et al., 2007; Fathi et al., 2014). Indeed, the work of Novitch and Butler highlighted the role of Prdx1 along with the GDE2 protein in mediating a thiol-redox reaction involved in the process neural regeneration process (Novitch and Butler, 2009). 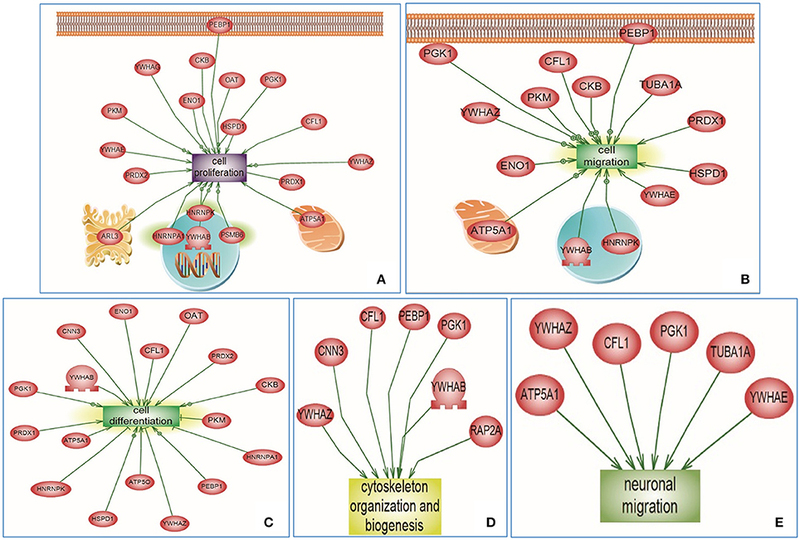 Other altered pathways identified included cellular migration and proliferation involving a number of proteins including Cofilin1, YWHAE, ATP5A1, TUBA1A, PRDX1, ADP-ribosylation factor-like 3, and ENO1 among others (Figure 6, Supplemental Tables 4A–C, 5A–C and Data Sheet 1 in the Supplementary Material). The enolase protein has been shown to promote cell migration in the context of cancer (Yu et al., 2010; Hsiao et al., 2013). Similarly, the brain specific creatine kinase protein involved in cellular energetics, has been correlated with loss of neural cell circuits function upon downregulation; however, its contributes a part to local cytoskeletal dynamics promoting cell migration via lamellipodia formation (Kuiper et al., 2009). The role of ADP-ribosylation factor-like 3 has been recently studied as an indirect mediator of cell proliferation and neurogenesis via binding to the signal transducer and activator of transcription 3 (Togi et al., 2016). Our data also corroborate with the finding of a pro-survival role of ADP- ribosylation factor-like-3 protein in neural progenitor cells (Zhou et al., 2013). In addition, cytoskeleton organization and biogenesis of biologically related proteins were shown to be among the major protein families to be altered in the context of Emx1 deletion. These include Cofilin1, calponin, destrin, and F-actin-capping protein subunit alpha-1 proteins (refer to Table 1, Figure 6, and Supplemental Tables 6A–C and Data Sheet 1 in the Supplementary Material). Also of interest, these groups of proteins involve actin-binding activity implicated in cell motility. Calponin protein expression has been suggested to be involved in neural cell contractility, proliferation, and migration (Represa et al., 1995; Ferhat et al., 1996; Ulmer et al., 2013). Similarly, destrin is also an actin-depolymerizing protein, which is closely related to Cofilin1 (Hatanaka et al., 1996) with a similar peptide sequence to the ADF (actin depolymerizing factor) protein (Hawkins et al., 1993), which is implicated in the regulation of neural crest cell migration (Vermillion et al., 2014). Along the same line, among the altered proteins Tubulin protein family including Tubulin α and Tubulin β (2a and 2c) also appears in high abundance (Supplemental Table 1 and Data Sheet 1 in the Supplementary Material). Tubulins play a key mechanical role in neuronal proliferation and migration during cortical development (Barkovich et al., 2012; Cushion et al., 2014). Both α- and β-Tubulin protein family bind and assemble microtubule polymers, forming the essential cytoskeletal structure during brain development with specific functions include facilitating neuronal communication by generating axonal fibers away from the cell body; as well as in assisting neuroblast proliferation and migration from the SVZ to developing neocortex (Desai and Mitchison, 1997; Dehmelt and Halpain, 2004, 2005; Guzik and Goldstein, 2004) The critical role of tubulin gene family is highlighted in the mutation studies identified in the neuronal specific α- and β-tubulin gene affecting the cortex, corpus callosum as well as basal ganglia (Kumar et al., 2010; Barkovich et al., 2012; Cushion et al., 2013, 2014; Amrom et al., 2014). In one proteomic study assessing temporal synaptic plasticity induced by GABAA receptor blockade, Tubulin β-2A protein regulated dendritic spine morphology and synaptic plasticity in the hippocampus (Jaworski et al., 2009). Another elegant recent study indicated that there existed an interaction of the Collapsin Response Mediator Protein (CRMP) family, CRMP2 and CRMP-4 in particular, with tubulin and actin proteins in vitro that appeared to mediate growth cones development (Tan et al., 2015). This newly identified interaction is of high importance, considering the role of CRMP family in mediating cell migration, differentiation, neurite extension, and axonal regeneration in the developing nervous system, (Yoshimura et al., 2005; Ip et al., 2014). Our data suggest that Tubulin α and Tubulin β (2a and 2c) were upregulated in the Emx1−/− NSCs, possibily attributable to be a feedback mechanism to counter balance the potential pathological phenotype of Emx1 deletion, although further experiments are warranted to ascertain this hypothesis. Of special interest to us were the down regulation of p-Cofilin1 protein in the Emx1−/− NSCs and the diverse involvement of Cofilin1 in several of the targeted biological pathways as well as in the global interaction map (Figures 6, 7; respectively). Neuronal migration and neurite outgrowth are highly regulated processes that both depend on the assembly and disassembly of F-actin via the formation of appropriate connections within the neural network. In vivo, the length of the actin filament can be regulated by members of the Cofilin1 family of actin filament depolymerizing factors. Cofilin1, a downstream target of Rho kinase, is an actin-binding protein known to orchestrate actin filament turnover and regulate neuronal migration and neurite outgrowth (Carlier et al., 1997; Meberg, 2000; Meberg and Bamburg, 2000). Cofilin1 has also been shown to regulate cell cycle progression during cortical development (Bellenchi et al., 2007). The loss of Cofilin1 leads to the depletion of the ventricular zone neuronal progenitor pool and reduced cortical layer formation (Bellenchi et al., 2007). Aberrant expression of Cofilin1 might also underlie the defective development and cell migration in the telencephalon of Emx2 mutants (Li H. et al., 2006). VEGF also enhances axonal outgrowth by signaling through the Rho family of GTPases and their effector serine/threonine kinases, leading to downstream Cofilin1 phosphorylation (Jin et al., 2006; Zhang et al., 2011). However, we are uncertain whether the defect in Emx1 KO NSC migration toward VEGF or other factors in the serum is related to the defective midline crossing of axons that resulted in the observed acallosal phenotype in the Emx1 mutant. Interestingly, the disruption of interhemispheric connection in the naive Emx1 KO mice did not significantly affect gross motor coordination nor learning and memory. However, it impaired fine motor function such as performance in the skill reaching task and reduced training induced neurogenesis (Hong et al., 2007). P-Cofilin1, on the other hand, regulates both cell proliferation and axon growth by promoting actin polymerization and cytoskeletal rearrangement. It is not surprising that training may lead to angiogenesis and the release of VEGF in addition to other growth factors that activate signals for neurogenesis in the WT, but less so in the KO mice due to an imbalance between Cofilin1 and p-Cofilin1 in the latter. The VEGF receptor tyrosine kinase FLK-1, previously shown to be expressed in endothelial cells, is also expressed in neural progenitor cells of the mouse retina (Yang and Cepko, 1996) and embryonic forebrain NSCs (current study). Thus, VEGF signaling through FLK plays a dual role in neurogenesis and angiogenesis during development. In the adult brain, the coupling between angiogenic blood vessels and neuroblasts further supports a neurovascular niche in the post stroke microenvironment (Ohab and Carmichael, 2008), suggesting that ischemic brain injury induces signals recapitulating those during brain development. One of the most important and well studied growth factors that regulate post stroke neurogenesis and angiogenesis is VEGF. Both exogenous VEGF and stroke-induced endogenous VEGF promote neurogenesis (Sun et al., 2006), while the blockade of endogenous VEGF receptor downregulates neurogenesis (Bao et al., 1999). Despite the impaired VEGF signaling and reduced neurogenesis in the Emx1 KO mice, ischemic stroke with distal occlusion of the middle cerebral artery did not induce a greater lesion size in the KO compared to the WT mice, neither did traumatic brain injury (TBI) (unpublished results). Interestingly, forelimb skill training induced neurogenesis in the uninjured WT mice, while it modestly induced neurogenesis in the KO mice after TBI (unpublished results). This suggests that brain injury and behavioral training elicit more growth promoting signals aside from VEGF that are conducive for neurogenesis in the Emx1 KO mice. In summary, we have identified Cofilin1 as one of the proteins differentially regulated in NSCs between embryonic Emx1 WT and KO forebrains. The defect in Cofilin1 phosphorylation induced by VEGF or other growth factors may, in part, be responsible for the reduced neurogenesis observed during brain development and in adult CNS that underwent brain insult. Future studies are needed to identify pertinent neurogenesis signal pathways that still remain unaffected by Emx1 gene deletion. 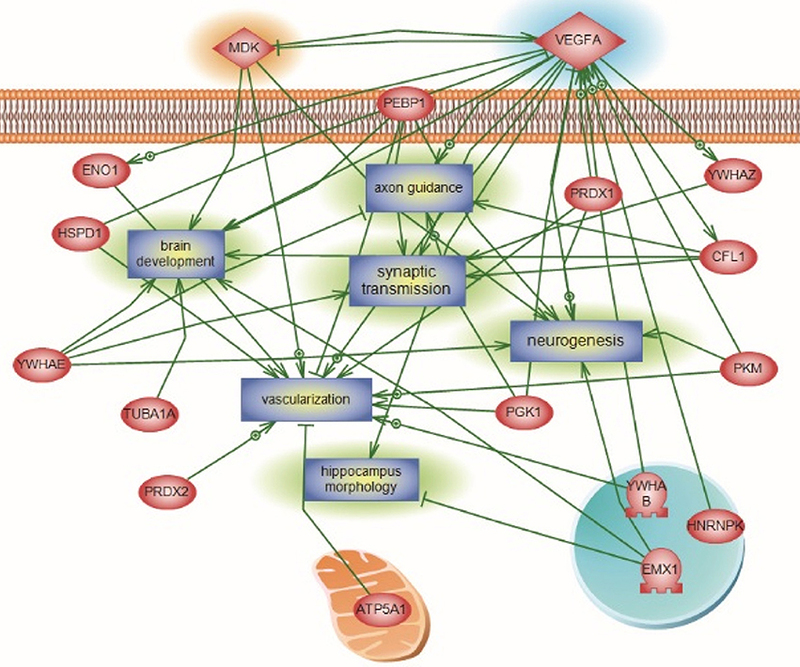 In addition, several identified differentially expressed proteins would be subject for further analysis to assess their exact role in neurogenesis and their contribution to the pathologic phenotype of Emx1 mutant. FK performed the proteomic pathway analysis and contributed to the interpretation and writing. KH conducted the migration assay and validated the differential expression of cofilin and p-cofilin. MN performed the 2D-PAGE and MS-MS analysis. SF contributed to cell counting. KJ contributed to western blot analysis. JL designed the experiments and wrote the manuscript. This work was supported by NIH grant R01 NS071050 (JL), VA merit award I01RX000655 (JL), and National Natural Science Foundation of China No.81403479 (SF). We thank the UCSF Mass Spectrometry Core Facility for the service and assistance in identifying differentially expressed proteins. We are also grateful to Ms. Yang Fan for the technical assistance in NSC culture. Bao, W. L., Lu, S. D., Wang, H., and Sun, F. Y. (1999). Intraventricular vascular endothelial growth factor antibody increases infarct volume following transient cerebral ischemia. Zhongguo Yao Li Xue Bao 20, 313–318. Bishop, K. M., Rubenstein, J. L., and O'Leary, D. D. (2002). Distinct actions of Emx1, Emx2, and Pax6 in regulating the specification of areas in the developing neocortex. J. Neurosci. 22, 7627–7638. Boncinelli, E., Gulisano, M., Spada, F., and Broccoli, V. (1995). Emx and Otx gene expression in the developing mouse brain. Ciba Found. Symp. 193, 100–116. discussion: 117–126. Daraselia, N., Wang, Y., Budoff, A., Lituev, A., Potapova, O., Vansant, G., et al. (2012). Molecular signature and pathway analysis of human primary squamous and adenocarcinoma lung cancers. Am. J. Cancer Res. 2, 93–103. Lamszus, K., Schmidt, N. O., Jin, L., Laterra, J., Zagzag, D., Way, D., et al. (1998). Scatter factor promotes motility of human glioma and neuromicrovascular endothelial cells. Int. J. Cancer 75, 19–28. Madri, J. A. (2009). Modeling the neurovascular niche: implications for recovery from CNS injury. J. Physiol. Pharmacol. 60(Suppl. 4), 95–104. Meberg, P. J., and Bamburg, J. R. (2000). Increase in neurite outgrowth mediated by overexpression of actin depolymerizing factor. J. Neurosci. 20, 2459–2469. Panganiban, G., and Rubenstein, J. L. (2002). Developmental functions of the Distal-less/Dlx homeobox genes. Development 129, 4371–4386. Pellegrini, M., Mansouri, A., Simeone, A., Boncinelli, E., and Gruss, P. (1996). Dentate gyrus formation requires Emx2. Development 122, 3893–3898. Piper, M., Dawson, A. L., Lindwall, C., Barry, G., Plachez, C., and Richards, L. J. (2007). Emx and Nfi genes regulate cortical development and axon guidance in the telencephalon. Novartis Found. Symp. 288, 230–242. discussion: 242–235, 276–281. Simeone, A., Acampora, D., Mallamaci, A., Stornaiuolo, A., D'Apice, M. R., Nigro, V., et al. (1993). A vertebrate gene related to orthodenticle contains a homeodomain of the bicoid class and demarcates anterior neuroectoderm in the gastrulating mouse embryo. EMBO J. 12, 2735–2747. Simeone, A., Gulisano, M., Acampora, D., Stornaiuolo, A., Rambaldi, M., and Boncinelli, E. (1992). Two vertebrate homeobox genes related to the Drosophila empty spiracles gene are expressed in the embryonic cerebral cortex. EMBO J. 11, 2541–2550. Yang, X., and Cepko, C. L. (1996). Flk-1, a receptor for vascular endothelial growth factor (VEGF), is expressed by retinal progenitor cells. J. Neurosci. 16, 6089–6099. Copyright © 2016 Kobeissy, Hansen, Neumann, Fu, Jin and Liu. This is an open-access article distributed under the terms of the Creative Commons Attribution License (CC BY). The use, distribution or reproduction in other forums is permitted, provided the original author(s) or licensor are credited and that the original publication in this journal is cited, in accordance with accepted academic practice. No use, distribution or reproduction is permitted which does not comply with these terms.